On June 3, engineers at iXs Research Corporation unveiled a robotic teddy bear designed to work as a talking car navigation system. The prototype robot stands 30 centimeters (1 ft) tall and has 6 joints in its arms and neck, which it uses to make gestures while providing spoken directions. 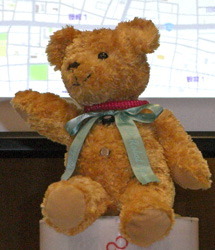 The robot bear is also equipped with functions to improve auto safety, such as an alcohol detection sensor embedded in its neck. If it smells booze, the robot confronts the driver, saying, "You haven't been drinking, have you?" Other sensors detect reckless driving, so if the driver suddenly accelerates or slams on the brakes, the robot says, "Watch out!" As a bonus feature, the robot bear provides information about nearby landmarks when you stroke its head. The company hopes to make the robot commercially available next year. "We want to make it more compact," says CEO Fuminori Yamasaki, "and we'd like to offer a variety of shapes, including other characters and a plain mechanical version." 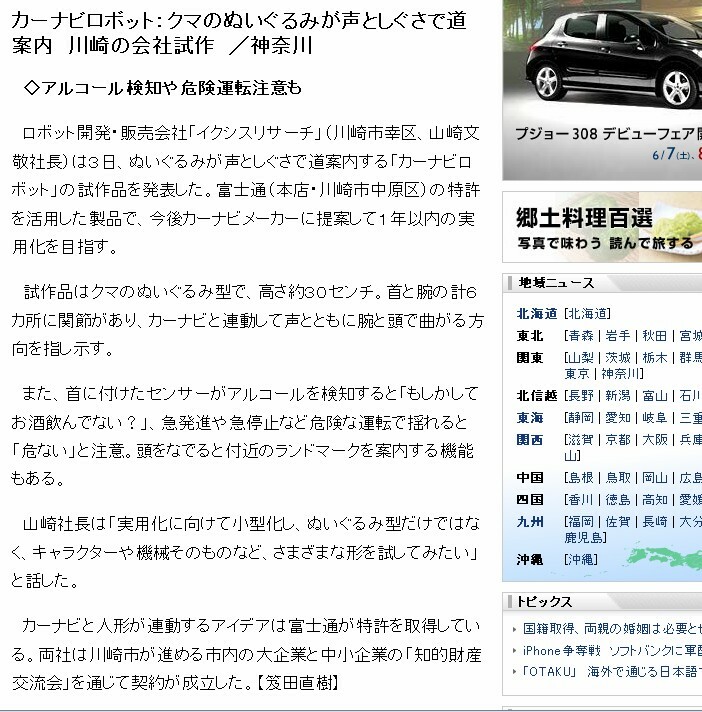 Fujitsu has patented the idea of merging car navigation systems with dolls, but it has granted iXs Research Corporation permission to use the patent through a Kawasaki-area project encouraging major corporations to share intellectual property rights with small-to-medium-sized companies. Really smart on one side... But, Chucky-like on the other. Wreckless driving has always been one of my goals. Reminds me of A.I. 's Teddy. It's RECKLESS driving, not wreckless. Aaaaargh. Why should I pay atention to an article written by someone who can't manage to learn simple, common words? Is this robot Teddy bear ready to be bought yet and if so how much? They also should make a squrrel or some other kind of stuff animal GPS just for a varity of chices to choose from. Make The Robot Teddy Bear Your Co-Driver! | Gaj-It.com - UK Gadget and Tech News, Reviews and Shopping Blog! !